This pattern is written in American crochet notation and uses 8 ply wool and a 4 mm hook. 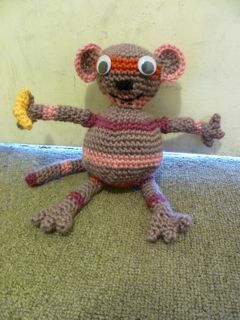 The monkey is 22 cm tall. The banana should probably be yellow but use whatever colours you like for the monkey. I chose brown, pink, red and purple. 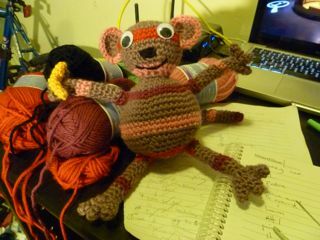 You will also need black wool for the face and some googly eyes. Round 34: decrease until the hole closes. 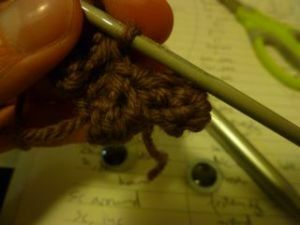 First we must make three fingers, which we will end up crocheting together. Fasten off when you finish the first two fingers and put them aside. Don’t fasten off on the third finger because we will now attach the fingers to form the hand. As with the arms, first we must make three toes, which we will end up crocheting together. Fasten off when you finish the first two toes and put them aside. Don’t fasten off on the third toe because we will now attach the toes to form the foot. Sew the arms and legs to the body. The purple of the arms should be attached to the purple ring on the body. The red of the legs should be attached to the red ring on the body. Sew on the tail and ears and the googly eyes. Embroider the nose and mouth. 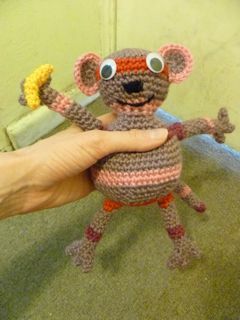 Sew the banana to one of the hands. looking for a smaller one. I appreciate your kindness.